Probably the best entertainment for you and your family if you go to the Algarve. 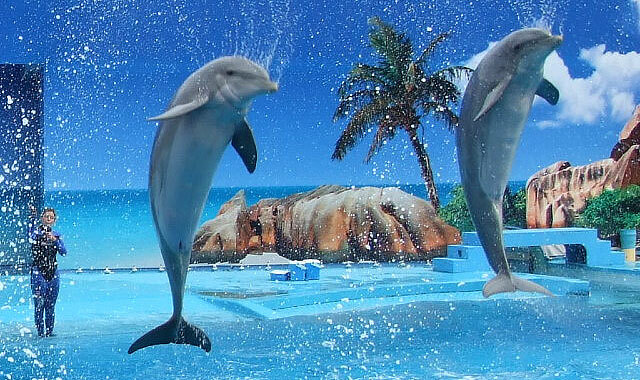 Covering over 8 hectares, it offers you everything from sandy beaches and watery fun, to educational exotic bird and dolphin shows. They offer this wonderful little interactive page to discover the park, highlighting each attraction for easier orientation. At the reception area, you find Kiddy Cars rental, so you can stroll around the place without having to fuss too much, an ATM machine, lost and found section and a gift shop too. The Zoomarine park is complete with 8 baby changing rooms and bathrooms, a restaurant and options to rent sun parasols and hammocks for a lovely mediterranean experience. Rapid River – swirling twirling river fun for families.